Gary Monroe pictured removing the cigarette machines this week. If you’ve made a New Year’s resolution to stop smoking, Monroe’s in Galway’s West End is the venue for you this year. 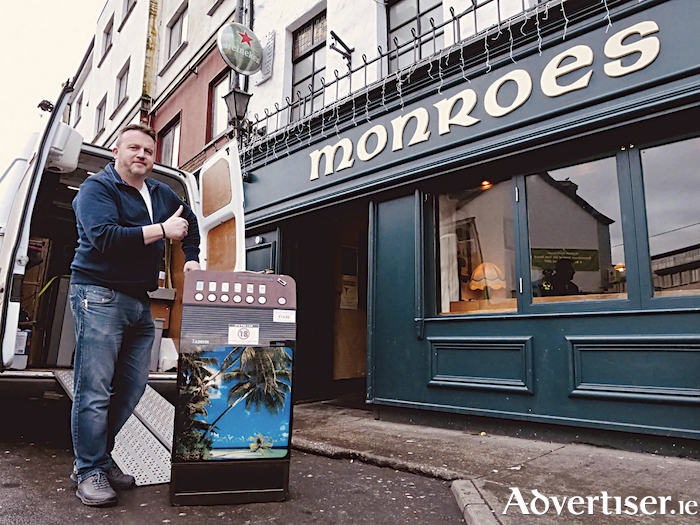 Monroes has become the first venue in Ireland this year to remove cigarette machines from the premises on Dominick Street. After decades on site, the machines were removed from the premises last Thursday. “It’s easy to keep a New Year’s resolution for a month or two but a healthier lifestyle in harder to maintain all year round, so we took this step to remove the machines entirely from both the Monroe’s Live venues and the Tavern, to start the year on the right note for our customers,” he said.